Sometimes when I’m writing blog posts as part of a group, topics come up that I feel wholly inadequate to write about. This is one of those posts! Our Everyday Scholé group is writing about how to maintain a restful homeschool when you are dealing with negative attitudes from your children. While I could write a post that sounds good about how to do this, it would be a work of fiction. In all honesty, I haven’t yet figured out a good way to keep my children’s whining, complaining, grumpiness, and hormonal mood swings from affecting my attitude and our homeschool. So instead of telling you how to fix the problem, I’m going to lay it all out there and talk about how it really works around here. When it comes to losing my mind, a few whiny, negative comments from my kids can cause teaching from rest to fly out the window. Usually this is for a couple of reasons: 1) We just did this exact scenario yesterday about the exact same issue and I’m over it. 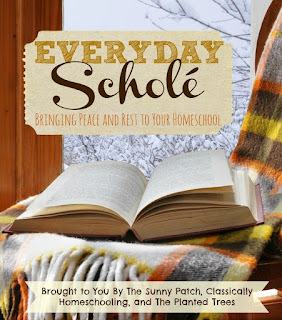 Or 2) I’m trying to give the kids plenty of free time, make things fun, spend hours researching curriculum, and a thousand other things to keep our homeschool fun and interesting, but I only get negative feedback. I wish I could tell you that I handle my composure and my attitude well during these moments, but I don’t. I do great at teaching from rest as much as it depends on me, but when I start adding my actual students into the mix things get difficult. Apparently they didn’t get the memo that we’re doing this homeschool gig via leisurely learning and restful teaching now so the bad attitudes are no longer welcome. However, despite my short-comings in this area there are some things that are helpful to remember when trying to stay in teaching from rest mode when bad attitudes show up. I can’t force them to change their attitude. This seems to be my default method for dealing with my kids’ when they’ve gone off the rails. If I find the right thing to take away or the right punishment, then they will magically turn into compliant angels. It doesn’t work that way. In fact it usually has the opposite effect. The more I try to force the more their attitude worsens. I need to be a thermostat not a thermometer. Thermometers reflect heat. In other words they don’t change the temperature, they just show the same. Thermostats, on the other hand, actually control temperature by not letting things get too warm. 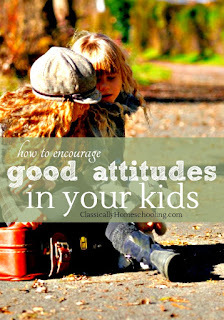 While I might not be able to force my children to have good attitudes, I can control the situation by not letting my attitude reflect theirs. We all need to take a break. When you homeschool you are around family all day long. While this is good, in some ways it can be bad as well. Sometimes poor attitude is the result of needing some space from each other or getting out of the house. If our day is really going south and everyone seems to be in a bad mood, I might try to do a fifteen minute walk around the neighborhood with the kids or let everyone have an hour of alone time to regroup. Be a detective. 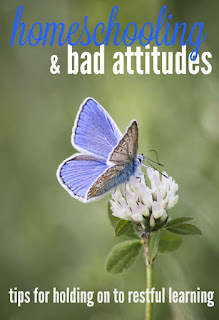 Bad attitudes almost always have a root cause and it helps me to remember to search for what it is. Are they not getting enough sleep? Are they hungry? Are they ill? Are they frustrated with the work I’m asking them to do because it’s too easy or too difficult? If you can cure the cause, the bad attitudes should soon go away as well. When I’m able to remember these four things, I am much more able to keep our homeschool time in the sweet spot of restful teaching and learning. What’s your go to solution when attitude problems arise? Appreciate your candor on this topic. My go to is to rationally explain why they should not be acting that way. It's horribly ineffective, but that's my reflex. What usually works is stepping back and doing the detective work you mentioned. We have to accept that some things are not going to happen the way we envisioned, but learning still happens. My lesson plans never included a 4 year old jumping up and down in my lap and running around the room acting out letter sounds. "Accept that some things are not going to happen the way we envisioned, but learning still happens." Love this! And it's so true. Love the thermostat/thermometer analogy! Hard to practice all the time. . . but so true. It is difficult. Thanks for stopping by! 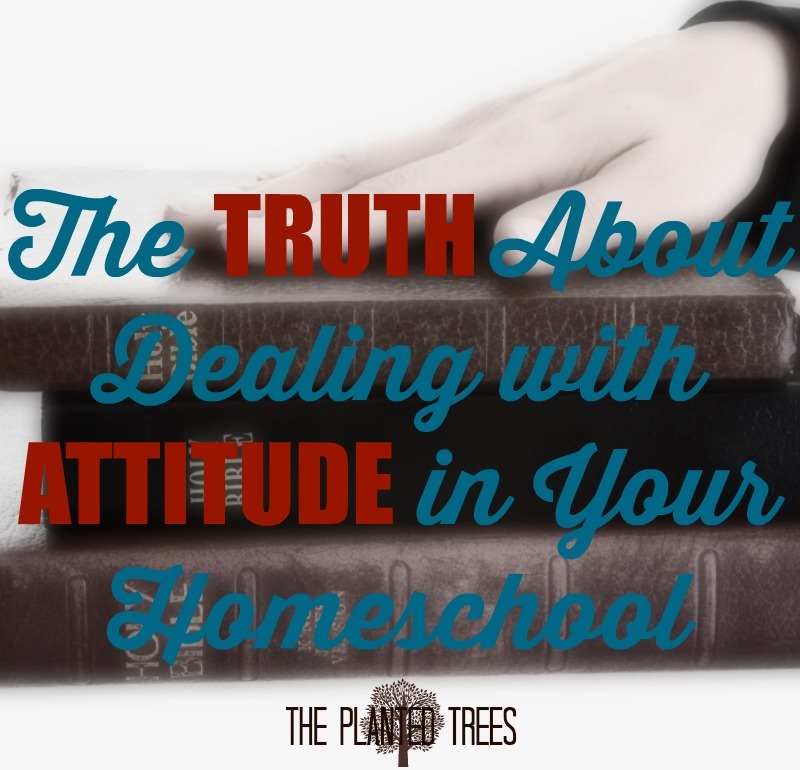 Attitude abounds here at our homeschool. With two teens and a tween and a four year old, some days I am just outnumbered. Good tips! Goodness gracious, yes! You're in the midst of attitude in three different age brackets. Just try to keep your head above water and kudos to you, mama! Thanks so much for this post! I love and appreciate your honesty here because I too let my kids attitudes rule me as well. Its so hard not to sometimes! I definitely feel better able to deal with this now after reading this blog post and the other ladies posts on this topic as well. Thank you so much!!!! Can't force them to change--- you hit the nail on the head with that one and yet it too is ALWAYS my back up reaction. Today my kids lost all screen privileges and one of them is going to bed an hour early. But while I find that forcing them to change does not work in the short term it does often work long term. A week or two with reduced privileges and reminders of bad attitudes and behaviors usually resets us. Thank for this, I will be referring back to it I’m sure. The ideal goal is to approach the child gently, help him to discover his own attitude problems, and then help him come up with a plan for improvement.